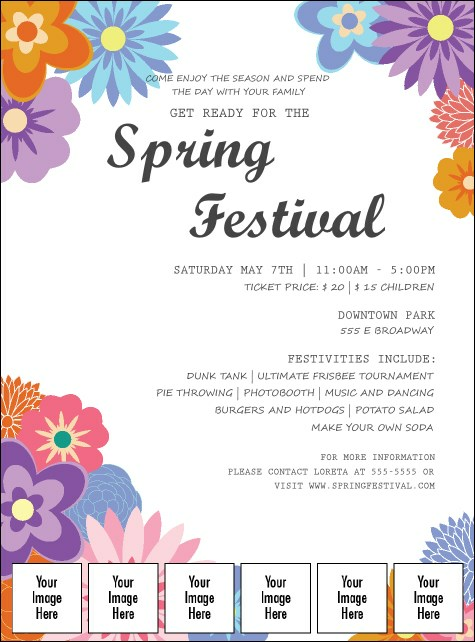 Bees are buzzing, butterflies are flitting…celebrate the season and announce your event using the Spring Festival 3 Image Flyer. Clusters of colorful flowers thrive in this design’s crisp white background and enliven your occasion’s information. In addition to several lines of customizable text, it offers six custom image uploads. Measurements approximate: 8.49" x 11.46"
Find an abundance of themed flyer templates on TicketPrinting.com.